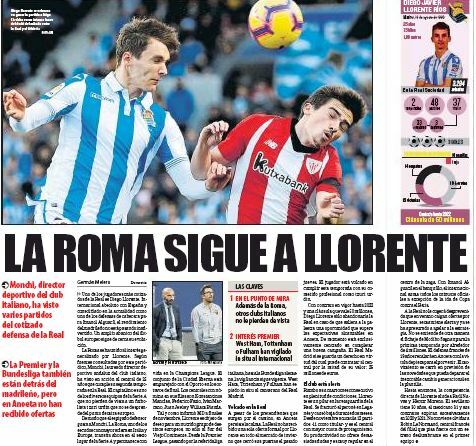 Last November, we relayed news from Spain that Tottenham Hotspur emissaries had travelled to the Basque region to watch Diego Llorente in action for Real Sociedad. Despite the English club keeping an eye on the defender, they didn’t make a official approach for him in January as La Real never received a formal offer for him in the winter market, according to today’s edition of Mundo Deportivo. The report says the centre-back has become the pillar of the La Liga outfit’s defence and his impressive displays have seen him draw attention from clubs across the continent. There’s still ‘interest’ from the Premier League in the Spain international and Spurs once again get a mention as the north London club have been keeping an eye on the 25-year-old since his time at Real Madrid’s youth system. 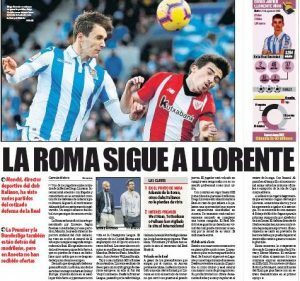 Llorente joined Sociedad in 2017 and Los Blancos have an option to sign him for €25m, which is 50 percent of his €50m release clause. Tottenham have Toby Alderweireld, Jan Vertonghen, Davinson Sánchez and 21-year-old Juan Foyth as the recognised central defenders in the squad. Alderweireld will turn 30 before the end of the season, while his compatriot will be 32 in April. The former Southampton player could leave this summer, and that’s prompted links with possible replacements. If Tottenham decide to sign a centre-back, whether Llorente will be included in the list of targets or not is to be seen.